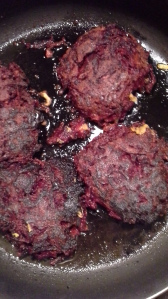 Beetroot and Chickpea Fritters – #burgers by any other name! A veggie #burger, no less! Beetroot used to be such a maligned vegetable, as some of us remember from the overuse of it in school dinners, but here it provides the basis of a family meal which cost pennies to produce. Dawn: It was quite labour intensive, especially as the beetroot is always messy to prepare. Andrew: Yes, even with a food processor, you have a lot of washing up, but the end product is quite amazing. Either grate the beetroot using the course side of a grater or use the grater setting on your food rocessor. Dawn: We suggest you use rubber gloves and wear an apron. Beetroot juice will stain your clothes and your skin. Posted on August 27, 2015 by Love Food UK	• This entry was posted in Dinner, Summer Sizzlers, Supper, Vegetarian and tagged how to make burgers, how to make veggie burgers, vegetarian burgers, veggie burgers. Bookmark the permalink.